I apologize for not posting pictures sooner. This past week was crazy getting back into the routine of work, school, and everything else. Here are a few of my favorite pictures from our trip to Yosemite and Sequoia National Parks. To the left are photos of Yosemite Falls. We were told they had just started "falling" about one week before we were there. Over the course of three days, there was less snow on the top and the sides and more water flowing. It was really an awesome sight to see. From what I understand if you visit in the summer, you don't get to see these falls because they are usually dried up by then. This is one of the many "babbling brook" pictures I took while visiting Yosemite. For as long as I can remember, I've always been drawn to water falling over rocks like this. I just love the calming sound it makes and I enjoy watching the water to see where it will go. It's always different depending on the rocks and other objects that get in the water's path. Another truly amazing place at Yosemite was Mirror lake. It was about a 1/2 mile hike to get to the lake over some snow and icy ground but well worth it. It was so easy to see how the lake got it's name. I don't think I've ever seen water so clear. The reflection of the formations and trees in the water was just beautiful. Again we were lucky to be there at this time of year. We met a lady who said by mid June the lake levels are so low that you don't get the reflections we saw that day. I'm so glad we took a chance and visited at this time of year. 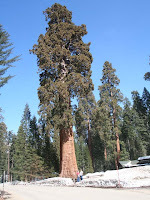 Here's a couple of photos from our day at Sequoia National Park. We were all amazed at these magnificent trees. We'd seen pictures, we'd read about them but until you are standing next to one there's just nothing to describe how small you feel. Below is Ron standing next to one of the trees. I took this picture from across the street with a wide angle lens laying down on the ground so I could get him and all of the tree. Left is looking up at one of the trees. We had such a good time on this trip. We all really enjoy getting out into the open, hiking, and clearing our heads. There's no better place to do that than a National Park. We've seen a lot of them, but there are many more to see. Think about planning a trip to one if you've never been. Visit www.nps.gov to find out more information on our National Parks.